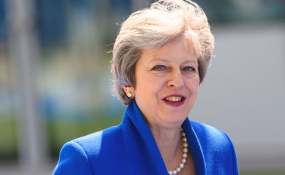 President Uhuru Kenyatta will on August 30 host British Prime Minister Theresa May in Nairobi to discuss issues on trade, security and a joint fight against corruption. It will take place four four days after meeting his United States counterpart Donald Trump in Washington. Mr Kenyatta will then travel to Beijing for the Forum on China-Africa Cooperation where he will also meet Chinese President Xi Jinping. "In the space of just two weeks, we will have hosted the Big 3 -- US, Britain and China -- and this goes to show our standing in the community of nations," Foreign Affairs Cabinet Secretary Monica Juma told journalists at her office on Wednesday. The meeting will be the fourth between the two leaders since the latter was chosen to lead Britain's exit from the European Union (Brexit). President Kenyatta and the UK Prime Minister first met in May 2017 during the third London Conference on Somalia before Ms May hosted him again in April this year during the Commonwealth Heads of Governments meeting. The two leaders have also met twice during the G7 summits in which President Kenyatta has been invited twice in a row. Kenya has a favourable balance of trade with Britain with Nairobi having exported Sh38.55 billion worth of goods to the UK in 2017, the highest of the Sh125 billion it fetched from Europe, according to the 2018 Economic Survey. Tea, cut roses and beans are Nairobi's top three exports to London -- with the total value of all exports having fluctuated since 2013. The highest earnings Kenya had from the bilateral relations in the five-year period was Sh40 billion in 2015. During the same period, Nairobi imported almost a similar amount of goods valued at Sh30 billion for last year alone, a drop from the Sh49 billion in 2013. "The balance of trade between Kenya and the UK is in our favour, and we want to see ways to enhance that going forward," Dr Juma said. Britain is also the largest source market for Kenya's tourism, with 168,000 British nationals having visited the country last year -- more than a third of the half a million European tourists who toured the country in 2017. With 100 British companies in Kenya -- employing tens of Kenyans -- the UK has remained the country's top overseas investor with over Sh128 billion in trade. London has also helped Nairobi in tackling the refugee crisis as Kenya hosts thousands of refugees from neighbouring countries, mainly Somalia and South Sudan. President Kenyatta's visit to the White House was confirmed two weeks ago, with a statement from President Trump's office saying "Kenya is a vital partner of the United States, and President Trump looks forward to discussing ways to broaden the strategic partnership based on our shared democratic values and mutual interests". "The meeting between the two leaders will reaffirm the long-standing relationship between the US and Kenya as a cornerstone of peace and stability in Africa and the broader Indo-Pacific region," the statement said. It added: "President Trump and President Kenyatta will explore ways to bolster trade and investment between the two countries, while strengthening security cooperation." In China, President Kenyatta is expected to meet with 50 other Heads of State in the continuing bid by Beijing to penetrate the 1.3 billion-people continent. "Our relationship with the US is getting better, and so is our relationship with China. There is no contradiction. This just goes to show that Kenya is ready to stand with everybody," Dr Juma explained when asked about the East-West trade war between China and the US, and where that puts Kenya. In fact, she argued, the huge interest that China has had in Africa "is a re-affirmation of the value of the continent", noting that Beijing, with its 1.37 billion people, was equally penetrating, and sometimes at an even faster rate, other continents.